For your convenience, we provide the following information to assist with travel planning. Attendees of the QoMEX 2013 can easily reach Klagenfurt by airplane, train & car or by a combination of these options. Klagenfurt airport (airport code: KLU) is easily accessible from the major airport Vienna. Regular flights between Vienna and Klagenfurt are offered several times a day. Star Alliance partners such as Lufthansa and Austrian Airlines operate numerous flight from many parts of the world via their Frankfurt, Munich or Vienna hubs. From several parts of Europe (Amsterdam, Oslo, London) Austrian Airlines operates flights to Ljubljana (Slovenia) via Vienna. SMS offers an airport shuttle from Ljubljana to Klagenfurt. 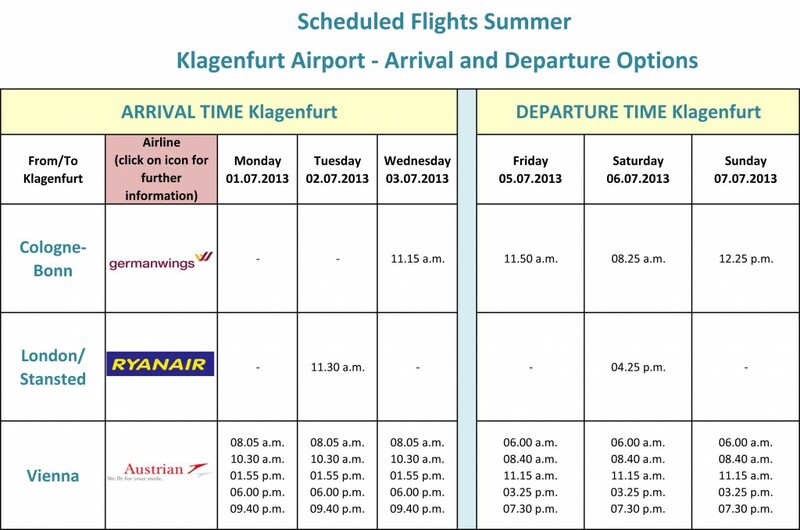 Klagenfurt Airport also has cooperation with the low-cost carrier Ryanair. London Stansted-Klagenfurt are offered several times per week. Many additional low-cost carriers operate flights to Klagenfurt and destinations in the vicinity of Carinthia (Graz, Salzburg, Trieste and Ljubljana are all within an hour and a half’s drive). Germanwings offer direct flights to Klagenfurt from Cologne/Bonn. See the detailed schedule below! The train station “Klagenfurt Hauptbahnhof” is located in the heart of Klagenfurt. Use the Online Ticket Service to conveniently book through the Internet or get the latest timetable.